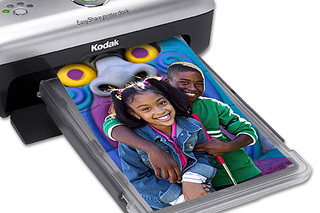 Dye sublimation printers provide us with archival 4"x6" prints from our digital cameras within minutes. For years now I've wrestled with inkjet printers to produce the lingua franca of amateur photography: the 4x6 print. I've used Epsons, HPs, and Canons, only to meet the same frustrating fate. It just takes too much fiddling around to squeeze out a few borderless snapshots. Don't get me wrong, I've had great results producing colorful business forms and 8"x11" enlargements. I expect to spend a little more time on those types of output. But 4"x6" prints, whether from Photoshop, iPhoto, or directly from the camera, should be fast and simple. So, I began researching dye sublimation printers (dye sub, for short). Not the big ones that cost lots, but those little portable units that specialize in snapshots. They use dye sublimation thermal transfer printing. After you send the image to the printer, the paper makes four passes across the printing element. The first pass is yellow, and you don't see much image detail at this point. With magenta, the second pass, it begins to look more like a photograph but not a pretty one. After the third pass, cyan, the image snaps to life and looks beautiful. Most printers add one more layer, a coating that protects against UV rays and moisture. A very nice touch! You can actually run water across these prints without damaging them. And the images last for years and years. I was just thinking... since you can get many of these printers for less than $100, they make a good gift for the snap-shooter in your family. It's strange to see just how many different sites there are on this subject I don't know if I'll ever need to be back, but it is awesome to know I stumbled upon the one that has a lot of helpful information if this comes up for me again.